(b. 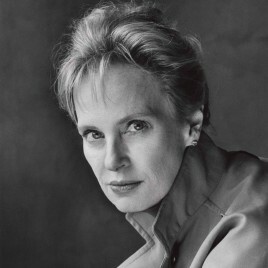 1955) is an American writer, essayist and poet. She was born in Minnesota. As a teenager she attended school in Bergen, Norway, where a part her family comes from. She returned to the US to study. In 1977 she graduated in history (St. Olaf College, Minnesota), and 9 years later was conferred a doctorate at the Columbia University. Her debut volume of stories The Blindfold saw print in 1992 (Polish edition 1999, translated by Krzysztof Obłucki). As an essayist she deals first of all with painting and visual arts, but equally often takes up the themes on the border of psychology, philosophy and neurology. Hustvedt’s prose has been translated into 30 languages. Her six books were published in Poland: her debut, and The Enchantment of Lily Dahl (2000, translated by Magdalena Słysz), What I Loved (2006, translated by Renata Gorczyńska), The Sorrows of an American (2011, translated by Wojsław Brydak), The Summer Without Men (2014, translated by Joanna Hryniewska) and The Blazing World (2017, translated by Jerzy Kozłowski). Her most recent novel was nominated for the Booker Award.